The launch of the construction works on Amulsar gold mining project was marked with huge arrogance. The ceremony was attended by the Armenian top officials, the Prime Minister of Armenia Mr. Hovik Abrahamyan, Minister of Energy and Natural Resources Levon Yolyan, Minister of Economy Artsvik Minasyan, heads of communities of Jermuk, Gndevaz, Saravan and Gorayk. Lydian board of directors, several shareholders, representatives of EBRD and IFC, heads of Yerevan offices of the World Bank Mrs. Laura Bailey and IMF Mrs. Teresa Daban Sanchez also attended the ceremony. Ambassador of the USA in Armenia Mr. Richard Mills and Ambassador of the UK in Armenia Mrs. Judith Farnworth dispatched their congratulations and welcome notes. The local heads also attended this event, for example, Jermuk Mayor Vardan Hovhannisyan, who has been actively opposing Amulsa project having concerns that Jermuk will lose its significance for tourists, where millions of dollars have been invested. 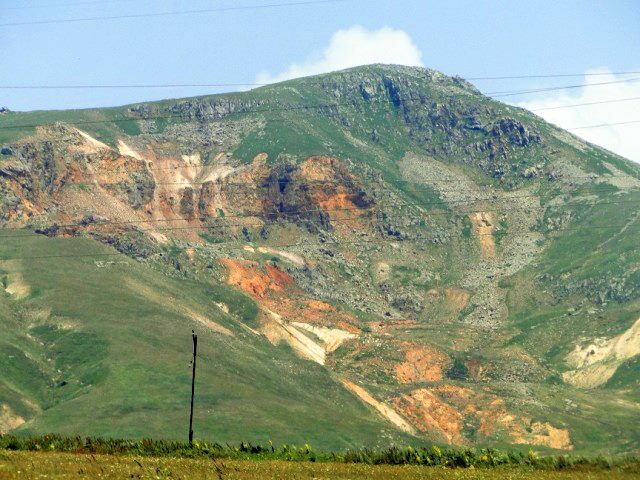 The problem is that Jermuk is under the impact of Amulsar mine, which shall be developed in opencast manner, the mine will be developed with explosions and the dust will be spread together with elements, heavy metals and active chemical compounds. It’s already three years since Vardan Hovhannisyan doesn’t make any comments on Amulsar. We are starting to give farewell to Jermuk, as it’s hard to imagine that people will strive for visiting “metal-saturated” resort for treatment and health. We are presenting a new documentary by Meira Valtonen and Megan Horvath entitled "Armenia's little Switzerland" shot tracing Amulsar project in Jermuk in September 2015 with the support of International CEE Bankwatch Network. Econews.am environmental informative website was founded in 2012. The main goal of the website is to raise environmental problems and to increase public awareness, to support the organizations and representatives of environmental initiatives concerned about environmental problems. Being an alternative within mass media specialized in providing information in Armenian, Econews.am provides reliable information representing the viewpoints of all sides concerned, covers activity and important events in this field. The principle of the website is to provide impartial and neutral information by maintaining the rights of all sides.